Ever since Donald Trump’s election to the presidency, the words “white working class” have had a hocus-pocus power in American politics. Coastal newspapers and television outlets have dispatched their reporters inland and to the exurbs, looking for insights into this group that comprises much of Trump’s core support. Books like J. D. Vance’s Hillbilly Elegy and Arlie Russell Hochschild’s Strangers in Their Own Land, about white working class folk, have soared off the shelves. If you run a Google news search for stories that include the phrase “white working class,” you’ll find tens of thousands of them. So it’s an astonishing admission that Joan Williams makes a few pages into White Working Class: the white working class, as we understand it, is a fiction. Specifically, what we call the white working class is in fact the white middle class. Williams even had a fight with her editor—she calls it a “lively discussion”—over the book’s title. “I wanted to call the group in the middle the middle class, because, well, they are,” she explains. But her editor argued that the term “middle class” is confusing in the contemporary United States because virtually all Americans imagine themselves to be part of it. (One also suspects that Williams’s editor, aware of how many books Vance and Hochschild have sold, might have had something of a profit motive to her argument.) Evidently, the editor won. Williams may have lost that battle, but in doing so she wins an intellectual war. Because even her editor’s victory proves one of Williams’ central claims: that Americans are really, really bad about talking about class. The language we use to talk about class misleads us about where we are, both as individuals and as a nation. That’s in part because American’s longstanding image of what it means to be middle class—to have a home, a steady job, and at least some financial safety net—is no longer the case. Those conditions are now only a reality of upper class (top 20 percent income-making) life. Today’s true middle class—people whose income lands them below the top 20 percent of earners but above the bottom 30 percent—does not fit that image. Most middle class Americans have jobs that are simultaneously boring and demanding, as Williams puts it, without long-term stability or benefits. Think: construction worker, medical technician, customer service assistant, bus driver. The real story of White Working Class is that middle class life in America today is a working class life: a condition in which the simple dignities of a steady job and a modest home and reliable health care are elusive and can only be secured, if at all, by “unrelenting drive and rigorous self-discipline,” as Williams puts it. From the perspective of the true middle class, then, the managerial elite— the office workers and creative types who fancy themselves to be middle class, though they are well ensconced in the upper income tiers—are both frivolous and woefully out of touch. The favorite values of that elite— values like self-actualization, free-spiritedness, and cosmopolitanism—are luxuries that the true middle class cannot afford. Same goes for the elite’s fascination with novelty; everything from the new fusion cuisines to the new family arrangements championed by the upper class feel, to middle class Americans clawing to maintain a grip on stability, like needless threats added to the manifold threats of ordinary life. Americans are increasingly catching on to the fact that there is a cultural divide in the nation, and a cultural divide that maps onto class divisions. 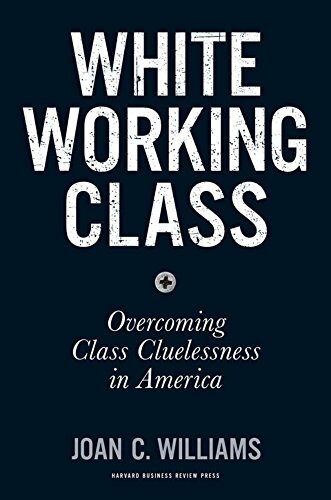 In White Working Class, Williams shows why it is that in today’s America, different class positions mean very different daily realities, and those very different daily realities support the development of very, very different values structures. And all that yields very real political frustrations for everyone involved. Williams deserves credit for being one of the first people to do this kind of accounting and explaining of contemporary American life. Let her not be the last, so that this age of hocus-pocus—and what Williams calls “class cluelessness”—might pass.